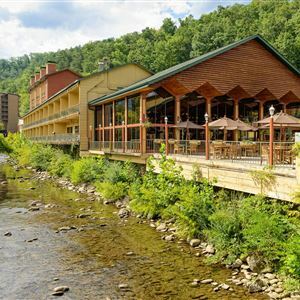 Property Location With a stay at River Terrace Resort & Convention Center, you'll be centrally located in Gatlinburg, steps from Ripley's Aquarium of the Smokies and Mountain Mall. This resort is within close proximity of Ripley's Marvelous Mirror Maze and Guinness World Records Museum. Rooms Make yourself at home in one of the 205 air-conditioned rooms featuring refrigerators and flat-screen televisions. Rooms have private balconies or patios. Complimentary wireless Internet access keeps you connected, and cable programming is available for your entertainment. Bathrooms have shower/tub combinations and hair dryers. Amenities Take advantage of recreation opportunities such as an outdoor pool, or other amenities including complimentary wireless Internet access and wedding services. Additional features at this resort include a fireplace in the lobby and a picnic area. Dining Enjoy a satisfying meal at a restaurant serving guests of River Terrace Resort & Convention Center. Quench your thirst with your favorite drink at a bar/lounge. Cooked-to-order breakfasts are available for a fee. Business, Other Amenities Featured amenities include express check-out, a 24-hour front desk, and laundry facilities. Planning an event in Gatlinburg? This resort has 21128 square feet (1902 square meters) of space consisting of a conference center and a meeting room. Free self parking is available onsite. With a stay at River Terrace Resort & Convention Center, you'll be centrally located in Gatlinburg, steps from Ripley's Aquarium of the Smokies and Mountain Mall. This resort is within close proximity of Ripley's Marvelous Mirror Maze and Guinness World Records Museum. Make yourself at home in one of the 205 air-conditioned rooms featuring refrigerators and flat-screen televisions. Rooms have private balconies or patios. Complimentary wireless Internet access keeps you connected, and cable programming is available for your entertainment. Bathrooms have shower/tub combinations and hair dryers. Take advantage of recreation opportunities such as an outdoor pool, or other amenities including complimentary wireless Internet access and wedding services. Additional features at this resort include a fireplace in the lobby and a picnic area. 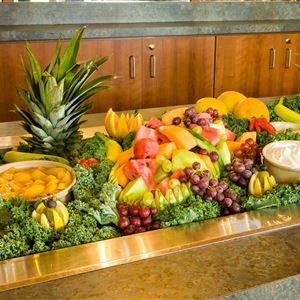 Enjoy a satisfying meal at a restaurant serving guests of River Terrace Resort & Convention Center. Quench your thirst with your favorite drink at a bar/lounge. Cooked-to-order breakfasts are available for a fee. Featured amenities include express check-out, a 24-hour front desk, and laundry facilities. Planning an event in Gatlinburg? This resort has 21128 square feet (1902 square meters) of space consisting of a conference center and a meeting room. Free self parking is available onsite.